ShopTill-e provides you with a full suite of tools to help you sell more easily across multiple sales channels. An array of features as standard to help you succeed; centralised inventory management, customer & order management, vouchers, discounts & promotions, shipment management, reporting and more! 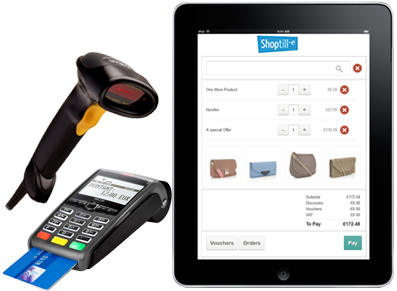 ShopTill-e is a true multi channel retail system – it’s a combined ePOS (online Point of sale) and ecommerce system that also integrates with Internet marketplaces, like eBay and Amazon, so you can sell everywhere using one central system. The ShopTill-e retail system takes away the worry and technical nightmare of trying to make separate systems talk to each other. Manage your inventory, stock, customers, orders and shipping easily and all in one place which automatically synchronises across the ePOS, Online Shop and marketplaces – meaning you only need to enter once, saving you time and ultimately money. And when sales are made the system will seamlessly update across your ePOS, Online Shop and marketplaces, ensuring that your stock levels are always current. Multi channel or stand alone – it's up to you! ShopTill-e is a multi-channel system and it’s this integration that can really improve the efficiency of your retail business. However the ePOS and eCommerce system can also be used on their own, this means you can start with just the ePOS or the eCommerce system and when ready move to the all-in-one, giving you peace of mind, knowing that your retail system can grow with you. That’s ok as our friendly support team can help you get started should you wish. Either use the live chat on the right, email or call us. We look forward to hearing from you.